Today, many of us in Louisiana woke up to what appears to be a continuing series this spring legislative season, the “Jindal Morning Reads”. This e-missive came from Louisiana Governor Bobby Jindal’s latest Washington D.C. based staffer Mike Reed, the governor’s current Deputy Communications Secretary. In his email, Reed announced that Governor Jindal started his tax reform tour yesterday. As part of this morning serving, Reed selected these below items to help prove momentum is on his side of the governor. The Jindal offerings include the not-unexpected "Jindal Support du jour" from the computer of Associate Professor Jeffrey Sadow. Also, starting today, Bayoubuzz will provide news and opinions from media sources throughout the state concerning Jindal’s tax reform plan and other legislative matters. Please do forward relevant items to us so we can try to provide a thorough and balanced resource of information as we all approach this critical upcoming legislative session. Here is the Governor’s “Morning Reads” followed by some of the rest of the story. Governor Jindal had a successful start to his tour fighting for tax reform in Louisiana. Take a look at theWDSU report from last night on the Governor’s event at the South Central Industrial Association in Houma where the plan garnered praise from citizens and lawmakers. In his speech, the Governor debunked myths being pushed by critics of the plan. Jeff Sadow Penned An Article In The Hayride Arguing The Proposal Represents, “Economically Beneficial, And Individually Empowering Ideas.” The plan is true tax reform, not a “tax shift.” … Department of Revenue analysis shows the typical lowest-income household will be better off by it on a net basis, because of the retention of things like the state’s Earned Income Tax Credit, sales tax exemption on unprepared food, medicines, and utilities, and because of a new rebate. Saving accrue in all brackets, the analysis shows. So for those who claim otherwise, that the typical lower- or even middle-income individual will pay more in net terms should be branded for what they are – ignorant or liars. The Tri-Parish Times Notes That Lawmakers Are Beginning To Give The Tax Reform Plan Some Favorable Reviews. Gov. Bobby Jindal’s proposal to replace the state income tax with an expanded sales tax is getting favorable – though cautious – reviews from local legislators. But, because the governor wants his plan to be revenue neutral, he’s proposing major increases in the state sales tax — raising the rate as well as the application. Under Jindal’s plan, hundreds of services and transactions — from haircuts to CPA services — would suddenly be taxed. That’s astounding news — because the governor touts his plan as making Louisiana more attractive to business. I’m not sure how raising business taxes makes us more attractive to business, but then again, a lot of things about this plan don’t quite add up. Speaking of businesses, the silence of the business community also doesn’t add up. Where are the Business Councils, the Chambers, GNO Inc., LABI and others? Why aren’t they speaking up? Do they want to pay more taxes? Everyone has been waiting for more details from the governor. He’s still keeping much of his plan under wraps — but what he has revealed doesn’t look very good for business. In all, the plan calls for the elimination of 76 specific sales-tax exemptions….. Eliminating personal income tax, Robideaux said, would not bring in extra revenue to the state. If eliminating personal income tax is not going to reduce the state debt, then why do it? Blanco said it’s a distraction from what the real problem is. Blanco said legislatures should be worried about teachers who are quitting their profession at an alarming rate or state workers who have not gotten a pay raise in five years. The legislature should be worried about people leaving the state for other jobs. Pierre and Landry said they are far from convinced the structure change will not worsen the lot of the state’s economic underclass. Mills expressed concerns about the administration plan’s for the health care system, and what might occur if the funding plan fall through. A varied group of Louisiana religious leaders, including more than 50 Baton Rouge-area pastors, are calling on Gov. Bobby Jindal to abandon his plan to eliminate the state’s income tax and raise sales taxes because they say it would harm the poor. The group, United Faith Community of Louisiana, delivered an open letter to Jindal on Monday urging the governor to use “a fundamentally different framework for tax reform” than the one he plans to push in the legislative session beginning next month. “As diverse as these traditions may be, we find unity around a few fundamental ethical principles: fairness, a concern for the least of these, and an obligation to make our voices heard when matters of justice are at stake,” the letter states. Most conservative policymakers at the federal level just want to sharply reduce the income tax, not eliminate it entirely. But more and more Republican-controlled states are deciding to go big or go home. So far, Govs. Bobby Jindal (R-La. ), Dave Heineman (R-Neb. ), andSam Brownback (R-Kan.) have announced plans to end their states’ income taxes, while North Carolina’s Republican state senate leader Phil Berger is calling for the same, with at least some backing from GOP governor Pat McCrory. This isn’t unheard of at the state level. 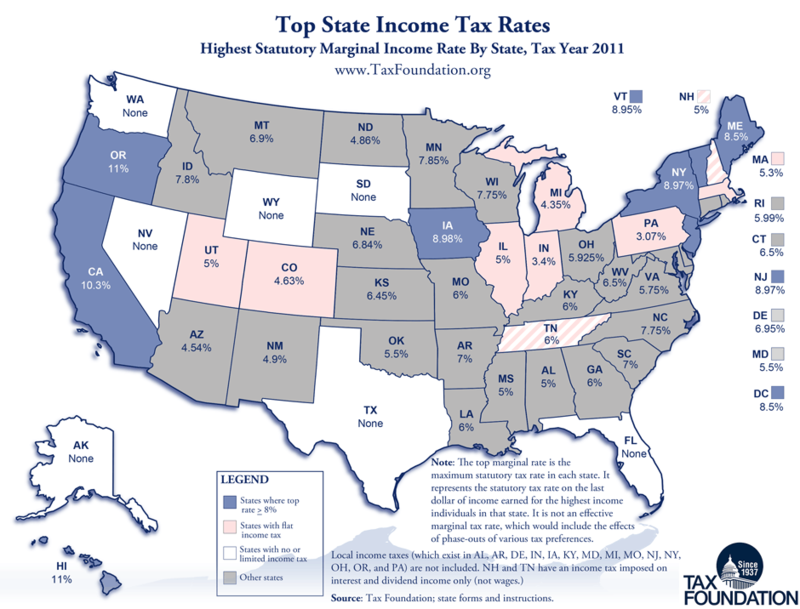 Seven states — Alaska, Washington, Nevada, Wyoming, South Dakota, Texas and Florida — lack any individual income tax, while Tennessee and New Hampshire only tax interest and dividends, leaving wage income untouched. That means we have a fair bit of information on what differs between states that tax income and those that only tax sales (including tobacco, alcohol, etc.) and property. So what do we know about abolishing income taxes?